Kong: Skull Island is a roaring throwback even this king can survive in the modern era! This 1970s style creature makes a monumental return to the big screen starring Tom Hiddleston, Brie Larson, and Samuel L. Jackson. When a satellite image reveals a mysterious island there could some truth to a myth that attracts the attention of scientists Randa (John Goodman) and Brooks (Corey Hawkins), who are members of the mysterious Monarch program. They must make it over to Skull Island before the Russian make there as only have limited resources along with rounding up funding and manpower they need amid the end of the Vietnam War. The men they band together that will be vital to this mission, a retired military man/expert tracker-survivalist, James Conrad (Tom Hiddleston), war photographer Mason Weaver (Brie Larson), a helicopter squadron led by Preston Packard (Samuel L. Jackson) and his men, and a group of scientists. Although they don’t know what the mysterious island may hold they are met with the dangers which threaten the island and the king who rules it, King Kong. After the destruction caused by Kong from helicopters and equipment, the group is split up facing the various mysteries that are great than Kong. The CG usage for Kong is amazing as it captures the intimidating weight and strength. It also encapsulates the subtleties of expression in his eyes and movement adding the scary tone that adds the King to Kong! From the human characters, you get a well rounded-relatable that utilizes the script given to them other than Toby Kebbell’s supposed Southern accent. You also have Tom Hiddleston, that makes all the roles he’s cast in entertaining and believable (i.e. Loki). Mason Weaver is a huge surprise as she’s useful to the story other than just being another love interest for Kong or Conrad. Most will compare this Kong to Peter Jackson’s King Kong and understandably so, there are some aspects of the previous Kong has over this one which is the battle between Kong and the two T-Rexes you feel enthralled with cheering on Kong as oppose to the battle Kong. Although this Kong has the intimidation factor that works, Andy Serkis’ gave Kong several emotional traits that connected the audience with the giant ape. There’s no secret that Kong: Skull Island is set in the Godzilla universe as it follows in the footsteps of 2014’s Godzilla but serves as a prequel and a lead-in to an eventual Godzilla vs. Kong film. Director Jordan Vogt-Roberts makes the most of his job as he moves each scene seamlessly giving the die-hard fans and first-timers a refreshing look at King Kong. 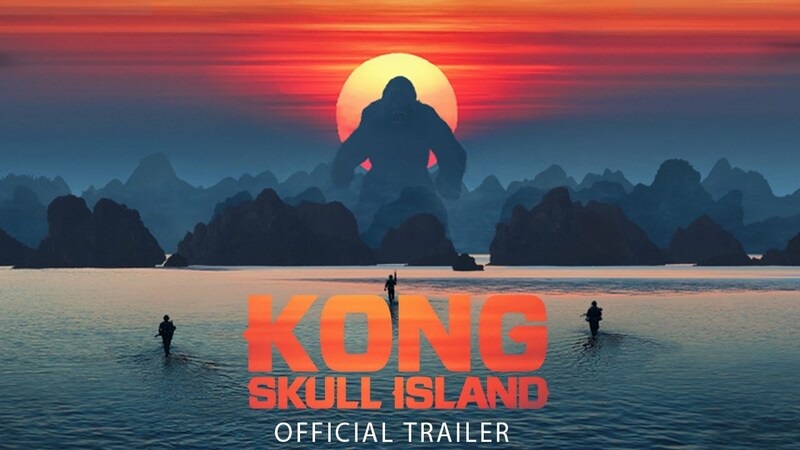 For all of Kong’s massive presence, he has little aura compared to reboots of this classic properties but with Hiddleston & Jackson a part of this film, be entertained.